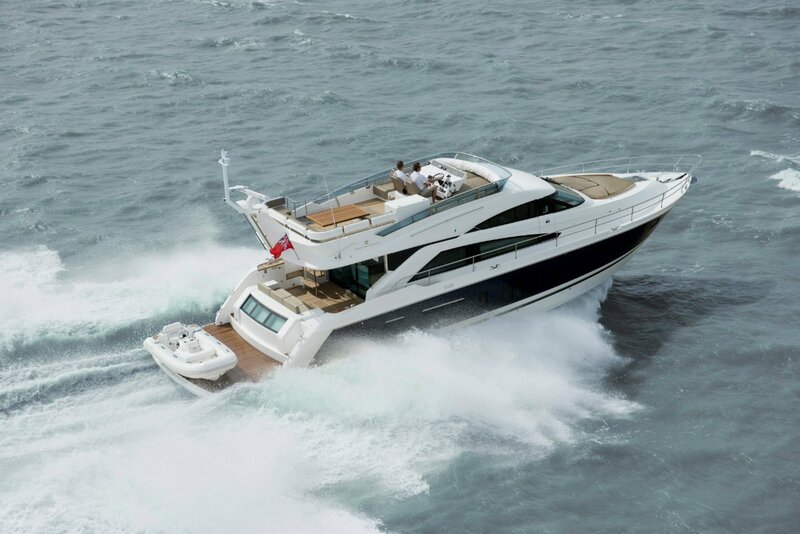 The Squadron 60 is Fairline’s latest model. To some extent it is a development of the 58, but has a lot of clever new ideas. 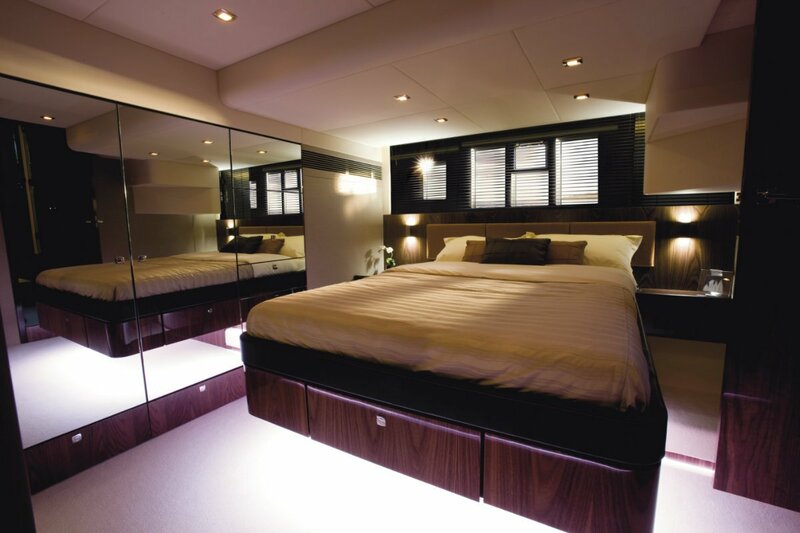 I particularly like the midships master suite. Full beam with windows both sides, and mirrors in most places there is not clear glass, it picks up apparent space by not having a solid walled bathroom taking out a large corner slot. 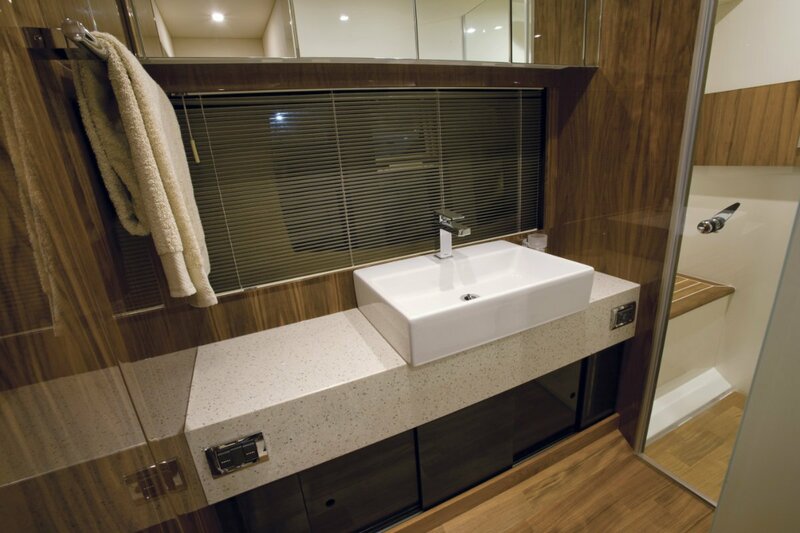 Instead, the bathroom runs the length of the cabin’s starboard side, and most of its inboard wall is glass, letting the windows shine through. Laying it out this way allows the queen size bed to lay fore and aft – always a better fit. The linear bathroom is a beauty; it feels bigger with this layout, and the fittings are first class – think 21st century Venetian palace. Not that the second bathroom is anything to sneeze at. Also fitted out to the highest standards its exclusivity is only let down by being at the disposal of the occupants of two cabins. One is the large forward double, the other a twin that can be converted to a double. 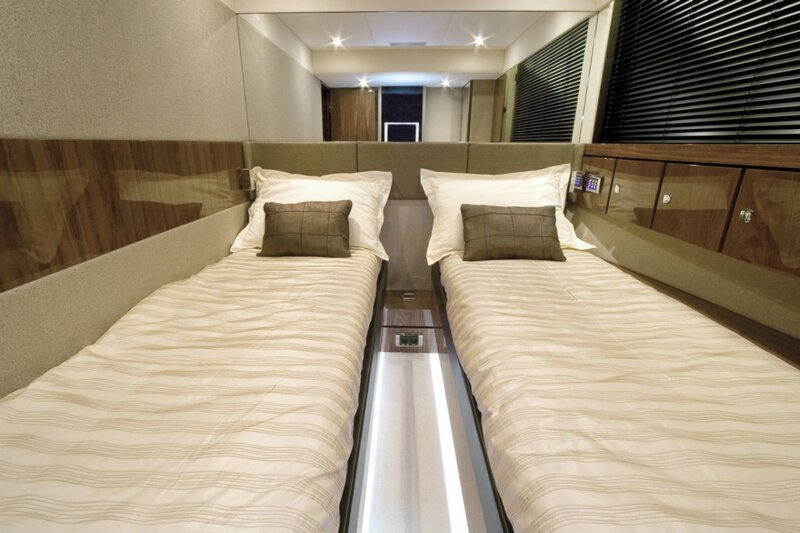 The cabins share in an excellent fit-out that includes feeler gauge-quality joinery, top lining materials, individually controlled air conditioning zones and piped electronic entertainment, also with individual controls. A pleasantly wide and shallow stairway leads to the control station with its two sumptuous seats and thence to the saloon. This is a vast space, and the designers wisely decided to emphasise the space rather than use it to contain lots of stuff. The forward half is dedicated to eating, the after half to having a good time in other ways. Preparing the food gets much the same amount of space as eating it: metres of bench space, cubic metres of cupboard volume, technophile quantities of electrical things to store and cook food. A shame that most of what comes out of the galley will be nuked in the microwave; serious cooking is far more likely to come from the cockpit’s barbecue. The dining space opposite is serious enough, with room for a solid bunch of friends around three sides of a table. For port they can move aft around three sides of a lower table for electronic entertainment, or to party with spill over into the cockpit. This has further spill-over potential onto a very large swim platform, the aft part of which hydraulically lowers to launch the tender. The cockpit, with large storage volume below it, is teak sheathed like the flybridge above that largely shades it. Both are large and, in Australian marine useage, important outdoor areas. The cockpit has a settee at the rear that closer inspection reveals as the upper part of the crew cabin. In Australia it is far more likely to be a child’s cabin, but it still has the best view on board; its large rear windows look out over the swim platform. 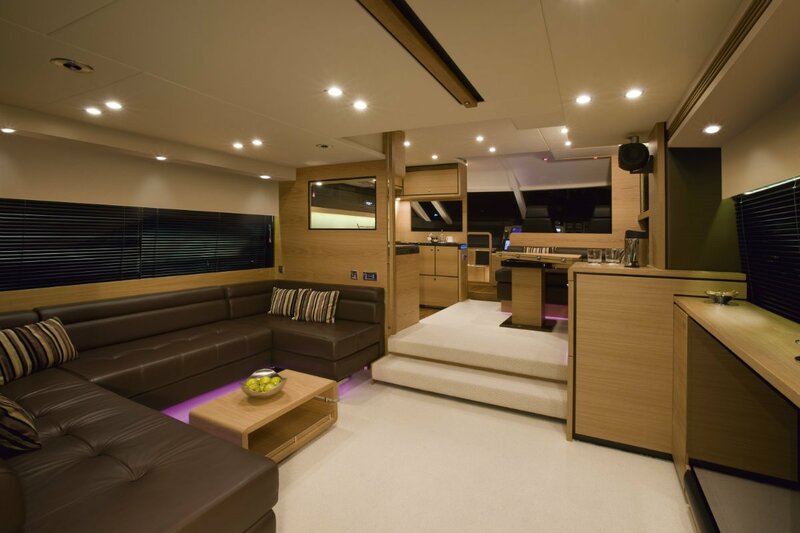 The flybridge is the most important outdoor area on board and has a similar deck area to the saloon. Similar functions too: driving seats forward, lounges and table aft; also a scattering of sun lounges and wet bar. The foredeck is also a useable spot, reached via side decks of just about the right width. More likely to be inhabited at anchor, it offers another conversation spot and sun beds with uninterrupted UV. The engine room of a boat dedicated more to hedonism than to the practical side of boating might be an unlikely target, but I like to check out the underwear of such vessels. This one impressed me no end. There is space around everything that needs it, double clamps on all hoses, logic in the layout that let me work out all the functions in minutes – and no need to crouch like a troglodyte. Main engines are a pair of Volvo D13s in your choice of 800hp or 900hp ratings. Either is good for 30+ knots flat out or 20+ effortless cruising. The price of the Fairline 60 has not yet been settled; think around $1.8m.